If you live in a New York City apartment building, you might be familiar with temporary walls. In fact, pressurized walls NYC residents are familiar with may also include homes, commercial buildings, and facilities. The value of pressurized or temporary walls is such that they provide a considerable number of uses in New York City and any community where space is at a premium. This is a wall that is installed into an existing room. Unlike permanent walls which become a part of the structure, these temporary versions are put into place and then “pressurized” so they fit against the floor, walls, and ceiling without causing any surface damage. This means that they stay in place just like a permanent wall, but can be easily removed with no damage to the room itself. Pressurized walls are quite popular in New York City and other urban areas where space is at a premium. In apartment buildings for example, a larger room can be sections off into two rooms which provides for another tenant in the building. This means with another person sharing the rent, yet still retaining some measure of privacy, the number of rooms can be effectively expanded in a single apartment building. It’s little wonder that the use of such walls has exploded across New York City and the rest of the US. For many, it is the most economical and practical solution to adding more tenants. In addition to providing for more tenants, there are other valuable uses for temporary walls that make them a great choice for residents and businesses alike. 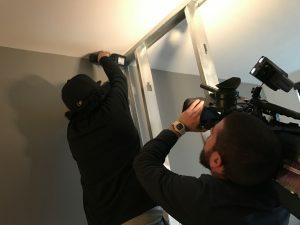 Turn One Room into Two: For couples that are adding to the number of family members in the home, a pressurized wall turns one bedroom into two. This is a simple way to maintain privacy without having to make an expensive renovation to the home. It can also be removed once they leave the home so you can use the room for another purpose. Repurpose Rooms: For residents and businesses that have one room that is too large for the purpose in which it is being used, changing it to two rooms offers greater flexibility. For businesses, this means adding new office space, work or manufacturing rooms while residents can create the den, reading room, or home office they have always wanted. Additional Storage Space: You can create a specific storage space that keeps your items out of sight. In this manner, you effectively create an additional room inside the home so you can keep more items stored. You can create small room, such as a closet for coats and clothing or a larger room to keep items safely hidden from view. Keep in mind that all additions are temporary so they do not affect the value of the property itself. You can have the temporary walls removed at any time and they will not leave any indication of their presence. That way, you can preserve the value of the home, building, or facility while making the additional changes that you want.